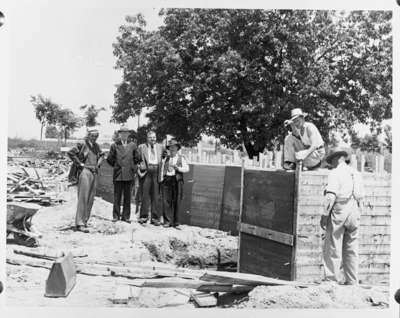 Black and white negative of a photograph showing officials of the Public Utilities Commission inspecting the work site during the construction of an addition to the sewage plant in 1948. Members of the construction crew can be seen at right. From left to right: Unidentified, William Pringle, Herbert Pringle, Unidentified, Unidentified, Unidentified. The sewage treatment plant is located north of Victoria Street just east of Dufferin Street. Construction of Sewage Treatment Plant Addition, 1948, Marjorie Ruddy. Whitby Archives 08-006-019.